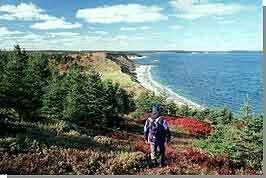 Nova Scotians have a long history of using and enjoying the province's wild spaces. Our protected areas offer some of the finest opportunities - from canoeing the remote waterways of the Tobeatic or hiking the scenic ridges of northern Cape Breton, to fishing a favorite wilderness stream or lake. Appropriate, low-impact recreational use of Nova Scotia's designated protected areas is recognized as an important objective. However, some activity restrictions exist in protected areas to protect special or fragile natural features and values. While the primary purposes of Wilderness Areas are protection-oriented, they also provide significant opportunities for recreation in a wilderness setting. 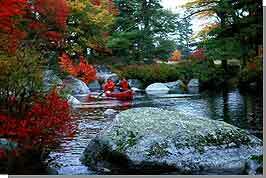 Wilderness recreation activities such as hiking, canoeing, skiing, birdwatching and kayaking are encouraged. Sport fishing, and traditional patterns of hunting and trapping are also generally permitted. Use of vehicles is restricted and must be authorized. The Department is currently clarifying and updating procedures relating to vehicle use, consistent with the application of the Wilderness Areas Protection Act . Camping is permitted in Wilderness Areas according to special conditions which are described in an Order on Camping and Lighting of Fires (PDF:9k). This Order was issued by the Minister of Environment and Labour in March 2001, to encourage 'no-trace' camping practices. These conditions, and other information on recreation, are described in the Keep It Wild brochure: A Guide For Low Impact Recreation In Nova Scotia's Wilderness Areas - Side 1 (PDF:4mb). With a strong emphasis on protection and research, Nature Reserves generally restrict most recreational use. While entry for the purpose of environmental and nature appreciation is generally permitted, activities such as hunting, fishing, use of vehicles, camping and other activities that might degrade fragile values of a Nature Reserve are not permitted. Heritage Rivers are recognized for both their natural attributes and recreational value. As such, the protection of traditional recreational opportunities on these rivers and lakes is an important part of managing these waterways.